This was simply (or not so simply) one of the most amazing performances I've experienced of Parsifal, arguably my very favorite opera. The production was stunning, the hand picked cast superb and caught up completely in the drama. I was only mildly concerned my seatmates had never before seen Parsifal (though are very familiar with it from recordings and broadcasts). I needn't have worried, they were, as I, blown away by what we saw as well as what we heard. Additionally, the chap sitting on my other side, a longtime Met goer, had never seen it before either. I asked, "So, how was your first Parsifal?" "I'm undone. Completely," was all he could manage. Gatti had the score so firmly in hand and the Met Orchestra responded splendidly through every inch of this amazing work. His nuanced, non-rushed reading glimmered in all the right places, the transformation music of the outer acts truly transforming, the pulse (and pace) in Act II's opening, dangerous sounding ... as it should be. The chorus, as ever, was superb, the multiple choir effects of the different levels of sound coming through incredibly across the theatre's sound system. Rene Pape's Gurnamenz is one that stands alongside the very best, his face registering so many emotions it was almost unbearably beautiful at times. During the first Grail ceremony, with (finally) nothing to sing, every gesture, every movement felt genuine. As he'd stare at Parsifal, his eyes and mouth registered a look of one barely daring to hope this young man was "the one." His way with the text remains a miracle, IN the Good Friday scene, just the way he uttered the phrase "Nun freut sich alle Kreatur" took my breath away revealing a dignified rapture . . . a genuine rejoicing. Likewise, Jonas Kaufmann gave a performance capturing youthful casualness, then in Act II, opening up for "Amfortas! Die Wunde!" with a sound that filled with pain as he finally comprehends, discovers what his purpose must now be ending that great monologue. with his desperate cry: "Erlöser! Heiland! Herr der Huld! Wie büss ich Sünder meine Schuld?" The intensity he exhibited from this point on was tremendous in every way. I enjoyed the interview with Peter Mattei, who spoke about people (like me) wondering something along the lines of, "Amfortas? You?" Haha! He gave one of the most riveting, painfully beautiful accounts of the role I've seen or heard, his great narrative in Act I, heartbreaking. Evgeny Nikitin was as spooky and commanding a Klingsor as one could hope for, literally dripping with blood, his malevolence both in voice and deed was not only palpable, it was terrifying. 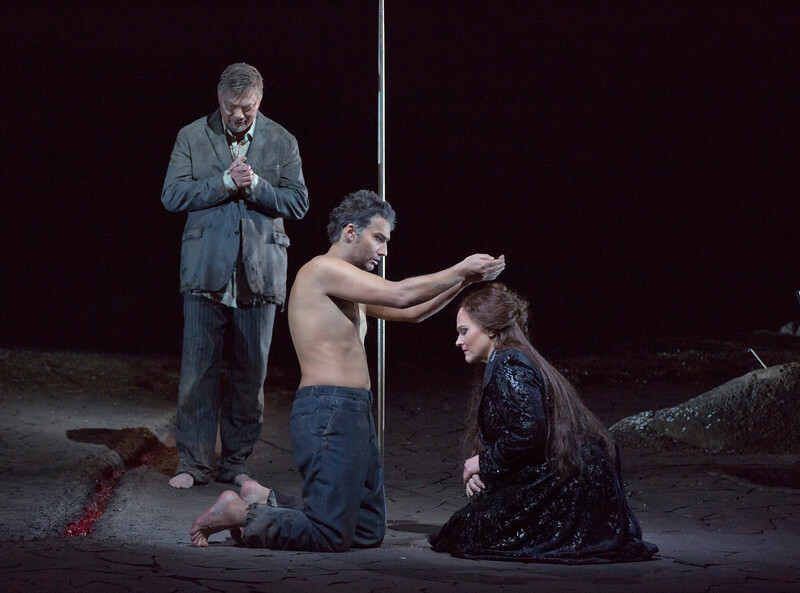 Katarina Dalayman clearly knows the essence of Kundry down to her toes and her three (well, four) appearances captured every nuance of the tortured woman (who in this production has been around not only centuries, but millennia). Her redemption at the end was a stunning, coupe de theatre, the spring in the dry, scorched topography springing back to life. When, finally now redeemed, she is allowed to die, (good directorial touch instead of the trend of having her live on . . . the lady's tired, let her rest, already!) redeemed, the actions of Gurnemanz and the new Grail King were infinitely moving. Francois Girard's production was a most remarkable achievement, along with Maestro Gatti and the company achieving a true realization of gesamtkunstwerk the likes of which I've rarely seen at this level. Even in this barren post-apocalyptic wasteland, there was a genuine, if raw, beauty about it all. The choreographed movements of the Flower Maidens will (along with everything else I saw and heard) burned, probably forever in my mind. Unforgettable in every way. 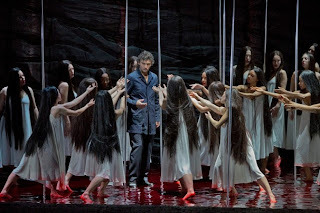 The score of Parsifal has my eyes moist, and a lump in my throat from the opening notes of the Vorspiel to the curtain's final fall and today's performance - visually and sonically was no exception. I used not to be a fan of Barbara Willis Sweet, but her work for the Met has not only improved, her video direction for today's performance could set the benchmark for "how it should be done." Few long, intrusive close-ups, and instead choosing to capture the stage either in its entirety, or large portions of it. I didn't miss seeing long stretches of singers' dental work or nose hair one little bit. Our theatre was (except for scattered seats in the horrible two first rows pressed up to the enormous screen) was packed. Everyone stayed, cheering, bravoing and applauding until long after the final credits had faded. I shall not forget this afternoon and the exemplary work the Met gave us from start to finish. I'm on a high right now that is going to stick around for days. I look forward to a (hopeful) release of this performance on Blu-ray, to experience this slice of Wagnerian heaven again . . . and again.